I need your help to identify this marks. Your photos have been blocked and are not visible. Is it working now ? Hi, yes French with Belgian import/foreign duty marks, the hawk head facing left for medium sized silver work, used 1809- 1814. The Belgian script E under laurel, E is for étranger/foreign for imported large silver-work used 1815-1832. I recognize the French walking rooster in octagon frame for 2nd standard silver (silver fineness 800/1000) used 1798-1809. JayT could probably tell you more about the other French marks and perhaps maker's mark. As oel points out, you have an interesting collection of marks on this covered bowl. -As oel states, a silver standard mark of a walking rooster in an octagonal reserve for 800 standard silver used 1798-1809. We know it is from the provinces because 2 is at the front of the bird. Next, the guarantee mark of a man in a circular reserve. I cannot make out the number of the province which should be found on either side of the head. The number would tell you where the object was made. Finally, a small mark which is too dirty and blurred for me to see. Photo 3 shows stamped initials over an old repair line. This is not a maker’s mark, but perhaps the initials of the repairman. You do not show a maker’s mark in your photos. Photo 2 shows some interesting marks. On the left an eagle with an open beak, facing left. If oel hadn’t said anything, I would have said that this is a 1809 recount mark (poinçon de recense) used on medium sized objects from the provinces. We would have to spend some time over a few beers to come to agreement whether this is a French mark or a Belgian mark. Next, a French boar’s head mark used after 1838. This mark might have been stamped when the object was repaired. Photo 1 shows a Belgian import mark, identified by oel. In summary, your bowl was made of 800 standard silver in the French provinces between 1798-1809. 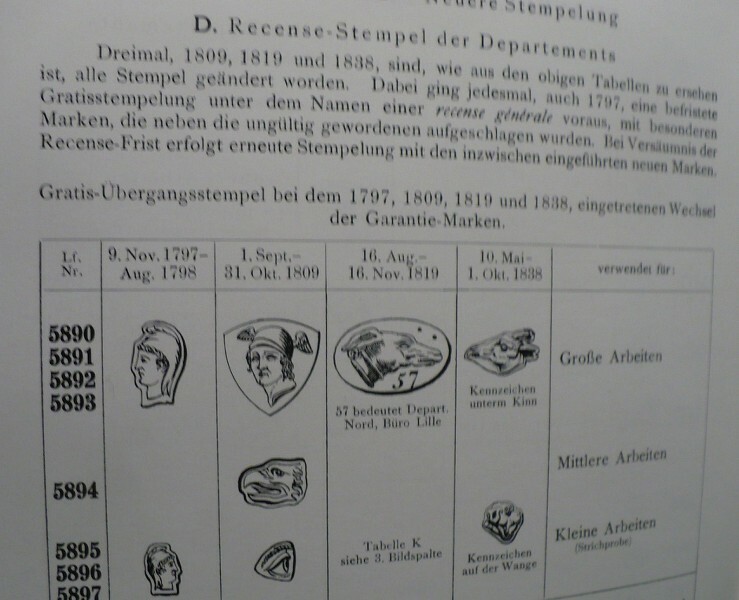 It was imported into Belgium between 1815-1832, or maybe earlier if oel is correct about the eagle head mark. The bowl was repaired at some point in its history. Hi JayT, you wrote; is a 1809 recount mark (poinçon de recense) used on medium sized objects from the provinces. We would have to spend some time over a few beers to come to agreement whether this is a French mark or a Belgian mark. Cheers to you Peter! If it is French, it was nice to see it, as the mark was used in the provinces for 1 year only in 1809. I used Marc Rosenberg IV. Band/Ausland und Byzanz (1928) Frankreich Departements ( France departments) and compared with # 5894, it appears the French hawk lacks an "eyebrow"
I think nothing strange about it, they are generally almost all Belgian Hallmarks. Chapeau Dendriet, you are right. The Belgian import/duty marks were applied after the old marks had expired and new marks were introduced when the bowl came up for (re)-sale. Riddle solved. In 1795 the Low Countries are conquered and occupied by the French armies. The Austrian Netherlands, the Prince Bishopric of Liege, Luxemburg and the present Limburg province are annexed by the French Republic. Proclamation of the Batavian Republic, a French satellite state. The Scheldt South bank and the Barrier Cities including Maastricht are ceded to France and gradually the hallmarks of France Republic and Empire were introduced.